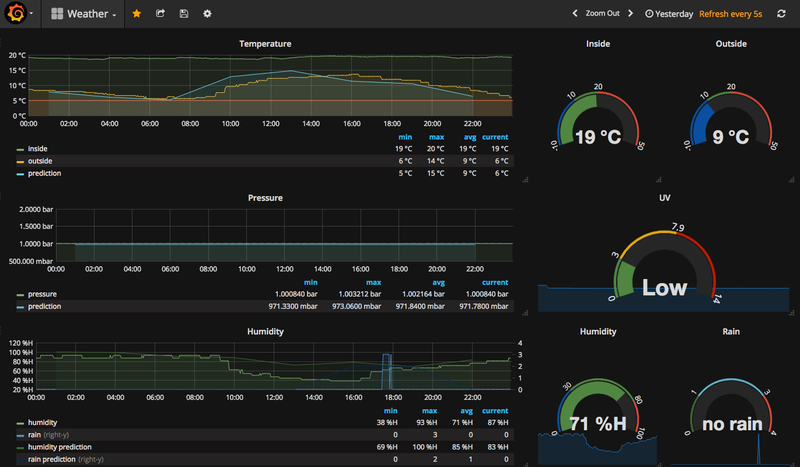 Want to learn how to use weather APIs with Grafana? Check out this tutorial on how to use the BeeWi temperature sensor and OpenWeatherMap API. Today, I want to play with Grafana. To give a little more detail, let me explain my recent experience with Granfana. I’ve got a BeeWi temperature sensor. I’ve been playing with it, and I decided that I want to show the temperature on a Grafana dashboard. Along with that, I want to play with the OpenWeatherMap API. First, I want to retrieve the temperature from the BeeWi device. I’ve got a node script that connects via Bluetooth to the device using the noble library. Therefore, I only need to pass the sensor mac address that I obtain using JSON with the current temperature. And, finally, we need to use another script (this time Python) to collect data from the OpenWeatherMap API, collect data from the node script, and store the information in an InfluxDB database. I’m running the Python script from a Raspberry Pi3 with a Sense Hat. Sense Hat has a atmospheric pressure sensor, so I will also retrieve the pressure from the Sense Hat. I run this script with the Rasberry Pi crontab every 5 minutes. That means that I’ve got a fancy time series ready to be shown in Grafana.